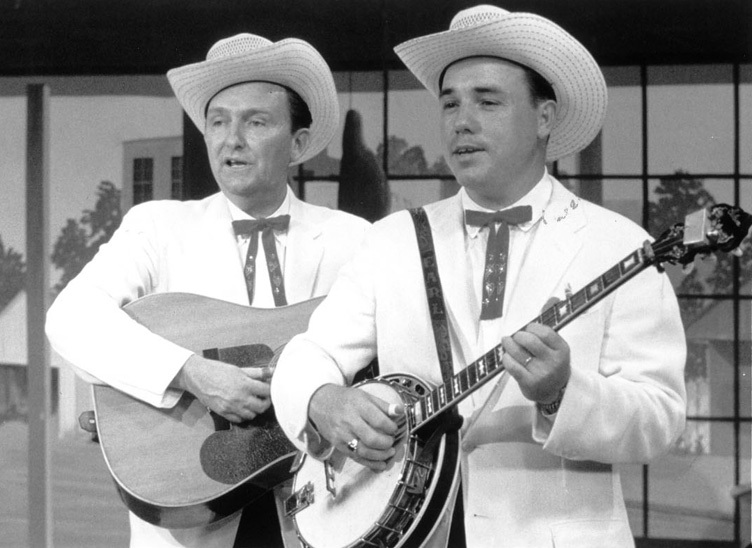 Earl Scruggs, perhaps the greatest banjo picker in the history of bluegrass, is dead. Scruggs, 88, apparently died yesterday in a Nashville hospital. And later, they brought bluegrass to the Top 40 with "Foggy Mountain Breakdown" from the movie Bonnie & Clyde. 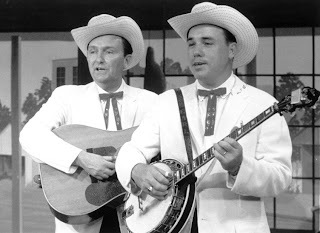 Both Flatt, who died in 1979, and Scruggs started out with Monroe's Bluegrass Boys back in the '40s when Monroe was in the process of inventing bluegrass. Scruggs is credited for introducing his 3-finger style of picking, transferring the banjo from a rhythm instrument into a lead instrument. He and Flatt left Monroe in 1948 establishing their Foggy Mountain Boys as a premier bluegrass act. They parted ways in 1969. By some accounts, politics divided them. 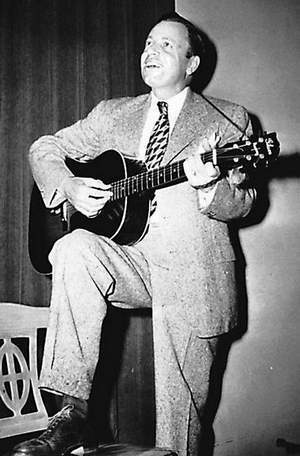 Scruggs appeared in 1969 at an anti-Vietnam war rally in Washington, D.C. Flatt, as were most most country and bluegrass artists at the time, was a supporter of the war. "... when staunch fans of bluegrass — a genre that would not exist in a recognizable form without Scruggs' banjo — railed against stylistic experimentation, Scruggs happily jammed away with sax player King Curtis, sitar virtuoso Ravi Shankar, piano man Elton John and anyone else whose music he fancied. 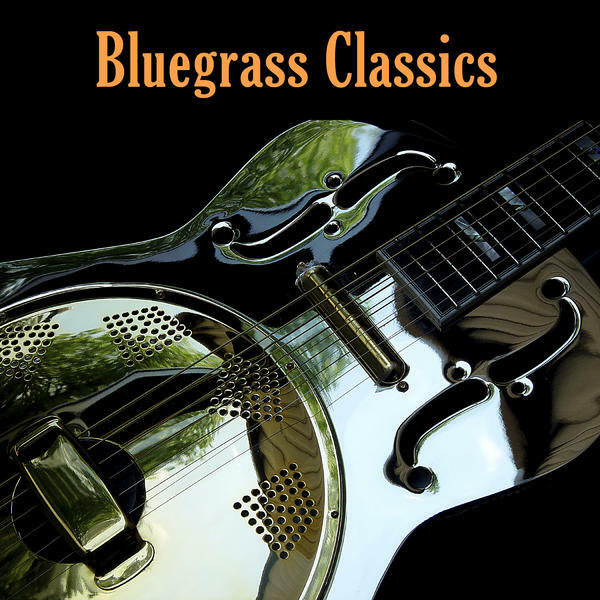 But it was in pure bluegrass where Scruggs excelled. 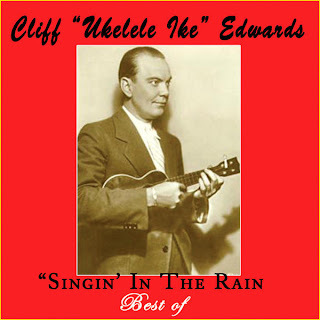 Just last week laid up in my own hospital bed, I watched a couple of episodes on the Old Flatt & Scruggs Grand Old Opry tv show, which is offered on Netflix's streaming service. For that hour, I forgot all about what ailed me. 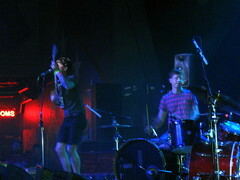 One of my favorite new discoveries from my recent trip to Austin was Thee Oh Sees from San Francisco. (I say "new discovery" meaning that I just discovered them. They've been around for a few years.) 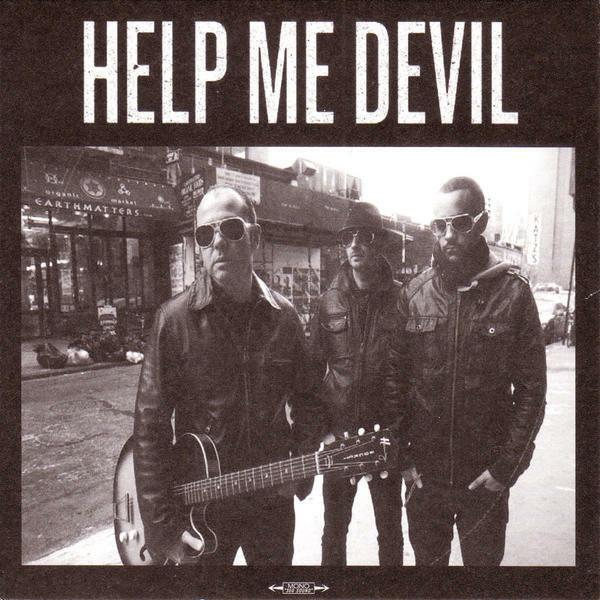 I saw them at the new Emo's East on the same bill as The Gories and Kid Congo Powers & The Pink Monkey Birds. As I suspected, Thee Oh Sees have a bunch of downloads over at WFMU's Free Music Archive. So get over there and listen and/or. download to your heart's content. 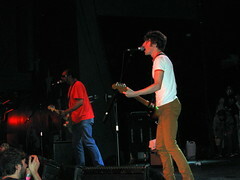 Or if you're too lazy for that, enjoy a rocking 2009 concert below. I spent Saturday night, my last night in Austin, at The Austin Moose Lodge. Moose Lodge? Isn't that the kind of place where your folks would play bingo in the '50s and '60s? Don't their roots go back to prehistoric days when Fred and Barney belonged to the Bedrock lodge of the Loyal Order of Water Buffalo? That's right. The Loyal Order of Moose, by God. It's an off-the-beaten track venue on the east side of Austin. There was plenty of parking and few, if any, people there actually part of the South by Southwest festival. It was a perfect place for the "Saving Muddy Hillgrass" party. This was a two-day event (unfortunately I missed the first day) organized by three institutions of the "underground country" scene -- Saving Country Music, The Muddy Roots Festival, and Hillgrass Bluebilly Records. 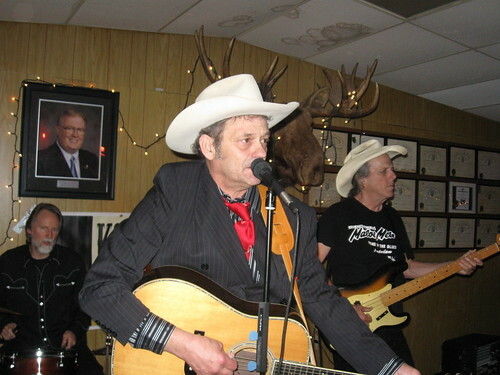 I arrived at the Moose Lodge just in time to see The Calamity Cubes, an acoustic trio from Kansas. When they pick up their instruments, you might expect them to be a raucous punk-bluegrass band. And indeed, they are capable of that. Their first couple of tunes Saturday fell into that category. 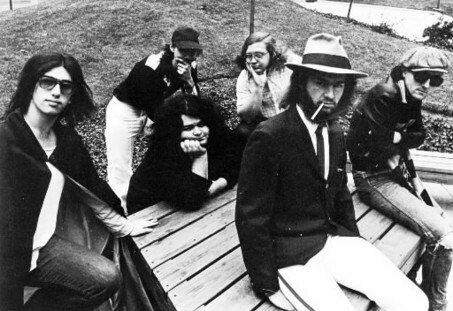 But the Cubes' most memorable songs are Blanche's slow, soulful, mournful country weepers. 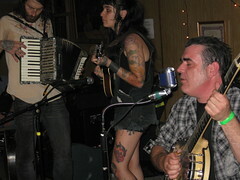 Many, perhaps most of the songs they played Saturday were from their upcoming album Old World's Ocean. 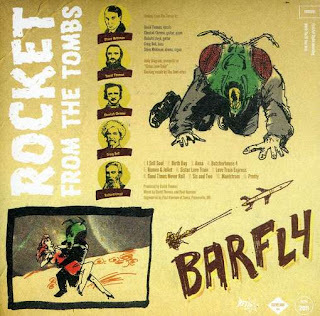 I'm not sure of the titles but among my favorites is a minor-key dirge that starts out, "You and I, we're like cattle in the slaughter house." Nothing short of stunning. Also excellent is the one I think they call "Empty Bottle" (it starts out "I'd rather have an empty bottle than no bottle at.") At first you might think is going to be a funny drinking song. But it's much deeper than that. I bought a CD-R copy of "rough mixes" of the album and my favorite songs they did Saturday are on it. 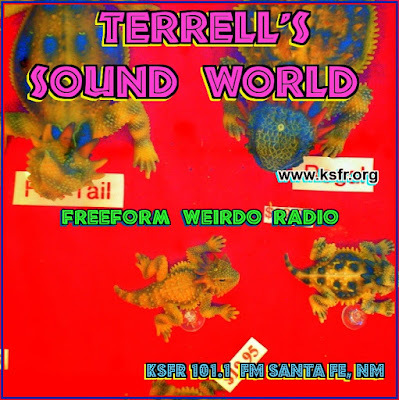 When I get back to doing my radio shows next month, I'll be playing it. 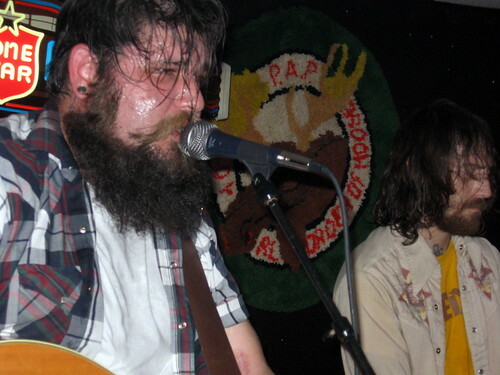 * Soda Gardocki: He's a singer/banjo picker from Knight's Ferry, California with a gruff voice and punk-rock past. He performed many songs solo, but my favorites were those in which he was joined by various friends. On several songs he had a fiddle player, but a few included mandolin, guitar, accordion, stand-up bass and drums. 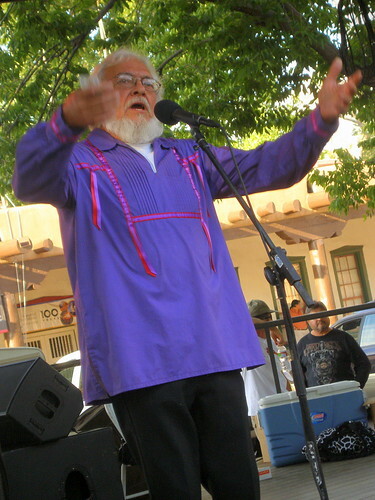 On song, he said, he wrote with his late grandmother, who was 97 at the time. * James "Slim" Hand. 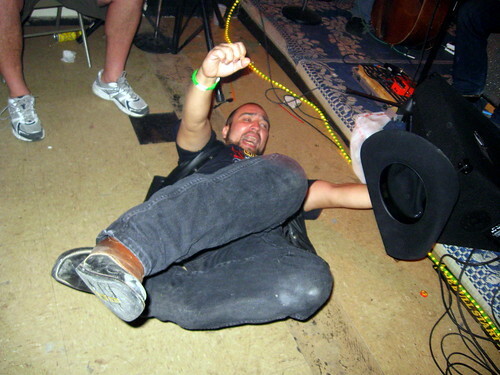 While I was watching Hellbound Glory, a man in a cowboy hat came up to me and shook my hand. "I'm James Hand," he said. A friendly gesture for sure, but I couldn't figure out why. But later, during his set at the party, he said he wanted to shake the hands of everyone in the audience. 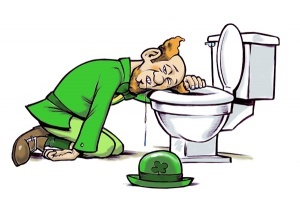 I guess with me, and probably others, he was just getting a head start. With a band that included bassist Speedy Sparks (he's played with Doug Sahm, the Texas Tornados and jillions of others) Hand delighted with a mix of country and rockabilly standards (fine, fine versions of Johnny Cash's "Get Rhythm"; "Mona Lisa," which sounded like it was based on Carl Mann's arrangement; and a hillbilly blues take on Jimmy Reeds' "Take Out Some Insurance." There were a couple of more acts on the bill, but I was a tired old man with a long drive home the next day. And I couldn't think of a better way than James Hand to end my 2012 South by Southwest. UPDATE: You can find my snapshots of the music I saw last week HERE. 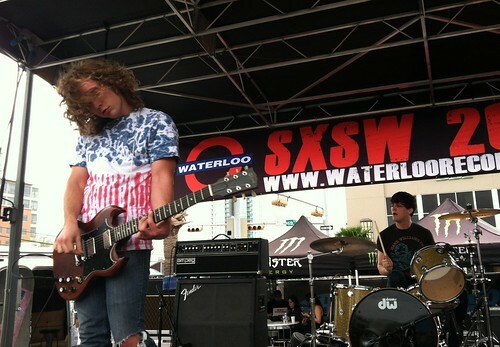 Thursday was a great day for rock 'n' roll spectacle at South by Southwest. Though most of the music I listen to -- be it rock, country, blues or whatever, is performed by artists with come-as-you-are fashion sensibilities, sometimes it's fun to see a full-blown costume party on stage. 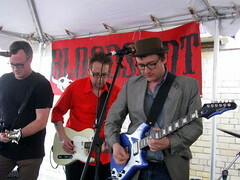 That was certainly the case with a German band called Bonapart, who played an afternoon party organized by Saustex label of San Antonio. They were already in to their set when I arrived and I couldn't believe what I was seeing on stage. There was a guy in a horse costume. One of the guitarists had a mask that looked like a terrorist gorilla (that's correct -- not guerrilla.) The keyboardist, to quote the Bonzo Dog Band, had "a head on him like a rabbit.." A woman with a Plasmatics-style Mohawk was charging out from the stage into the audience. Several costume changes ensued during the next few songs. The music was frantic and hard driving. I liked it well enough to buy a CD (My Horse Likes You) -- though on first listen it's not nearly as exciting as what I heard on stage. Although the German crazies was a hard act to follow, Pinata did the job. I guess Thursday was Saustex day for me. After the D&D party, I went to the label's official showcase at a downtown club called Karma. Unlike my bad experiences from the night before, I was able to get in by paying a cover charge -- an incredible $5. Glambilly had just started its set when I walked in. 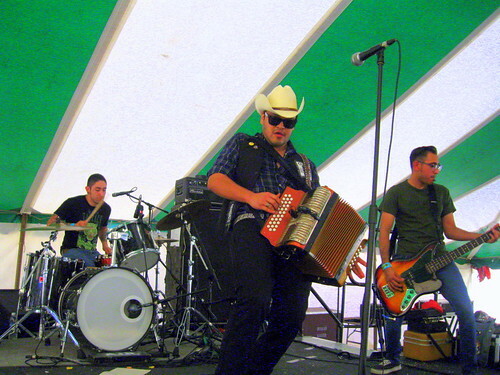 This is a San Antonio trio that infuses a basic cowpunk sound with a New York Dolls style glam-rock sound. 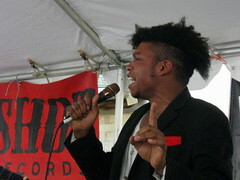 Glambilly concentrated on tunes from their album White BBQ Sauce, including a blazing version of "I Must Be the Devil." (I'm not kidding about "blazing." 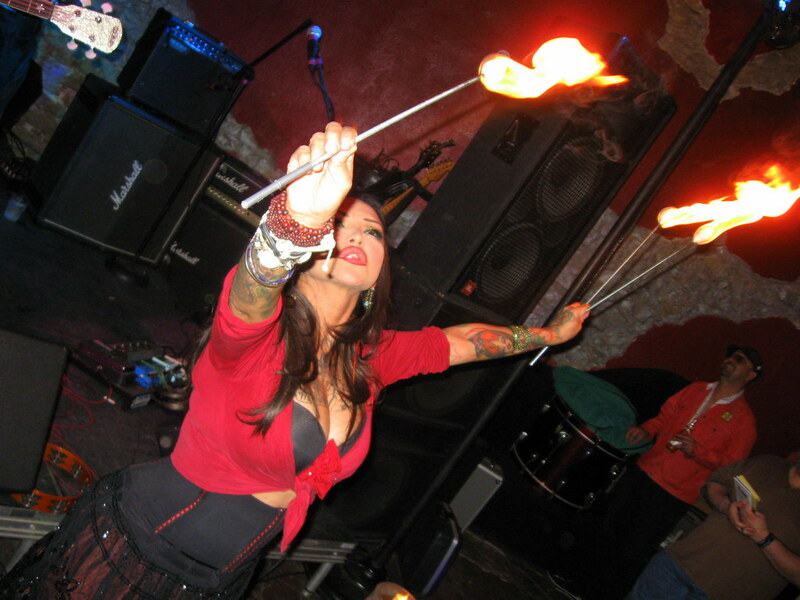 the performance was aided by a beautiful dancer/ fire-eater, who provided some real "glam." Glambilly was extremely tight. My only complaint is that they didn't do their cover of Bob Wills' "Stay All Night." 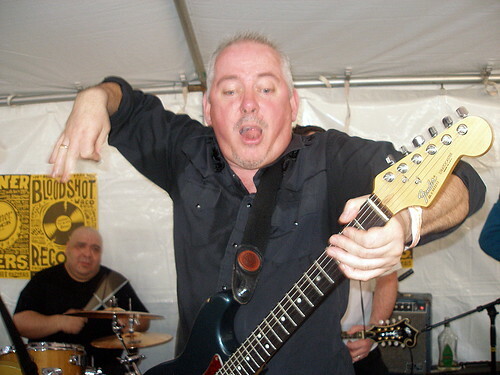 A San Francisco punk band called The Grannies followed. 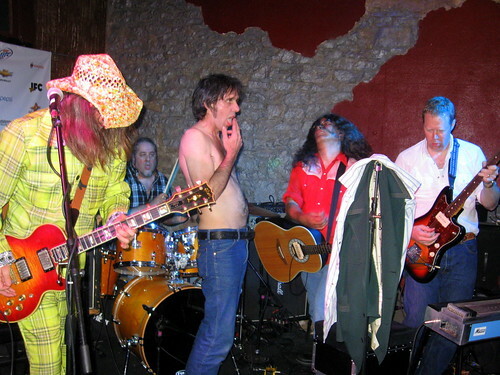 This was the second great costume-party band I heard Thursday. The members appeared on stage in granny drag -- bad wigs and even worse dresses. And their show was downright feral. 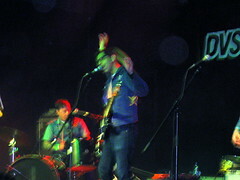 The singer frequently charged out into the audience to get the moshing started. But the set was way too short. Apparently some technical problem caused them to start 15 minutes or so after they were supposed to. Oh well, they were fun while they lasted. 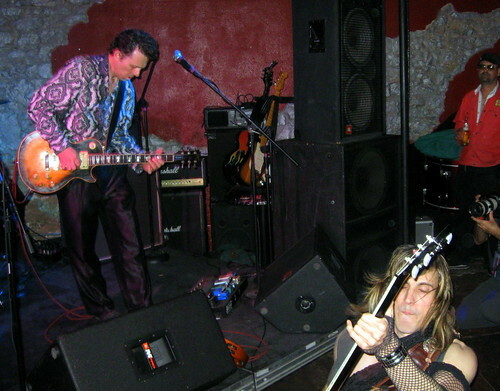 The last act I saw was The Hickoids, the band fronted by Saustex owner Jeff Smith and one of the first real-live cow-punk bands of the 1980s. 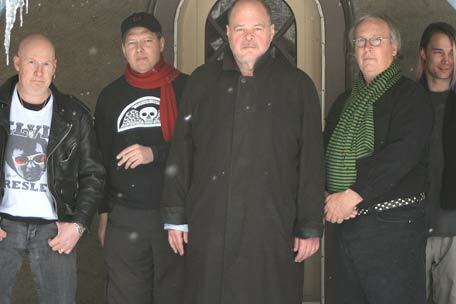 The group includes Santa Fe punk hero Tom Trusnovic (Monkeyshines, The Floors, Blood Drained Cows, 27 Devils Joking). 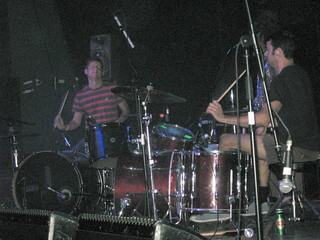 When they played in Santa Fe last year, Tommy was playing drums with The Hickoids. However, he's since switched to acoustic guitar. The band was bigger than the one that played at The Underground (Evangelos' basement). 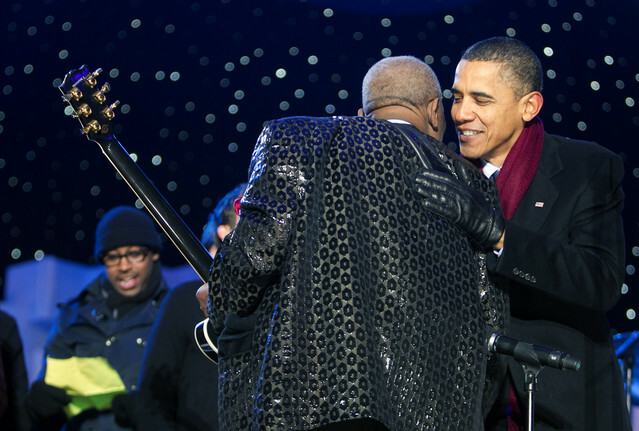 At one point they had four guitars blaring on the stage. As always they were loud, funny, obscene and rocking. They even make Elton John's '70s clunker "Bennie & The Jets" sound exhilarating. 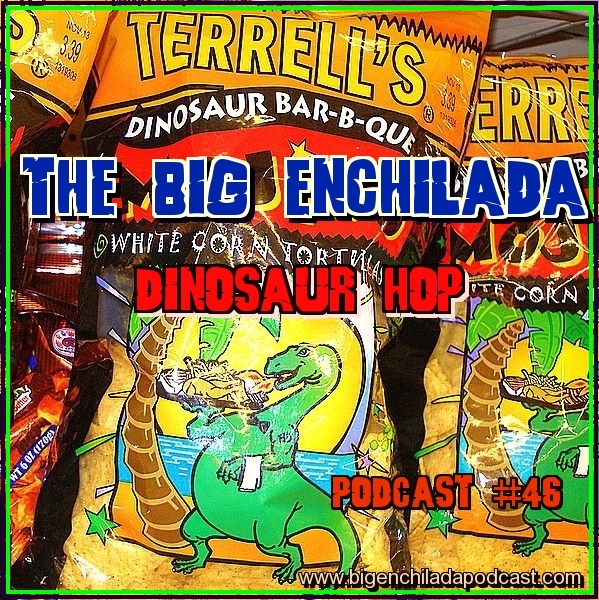 The Hickoids ponder the Universe. I learned a couple of valuable lessons for SXSW yesterday. 1) Austin traffic during the festival either has gotten a lot worse during the past 4 years, or at least is a lot worse than I remember it. And parking is even worse. 2) Not having a badge or a wristband is a lot harder than people say, at least for the nighttime, officially sanctioned events. The first lesson I learned after trying to get from my daughter's house in south Austin to Lovejoy's where Kid Congo Powers was playing a free show at 5:15 pm. After dealing with the traffic crawl and finding a $10 parking space about 6 blocks from the venue, I got there just in time to hear Kid Congo thank the crowd. I also arrived too late to see Eric Burdon (yes, former singer of The Animals) play a free show in the Hotel San Jose parking lot. That was my own fault though for stopping for a nice Mongolian BBQ dinner downtown. But then the badges deal: I figured my musical taste was so obscure there wouldn't be big crowds for some of the bands I wanted to see -- such as Lee Fields, a soul singer I like. I was wrong. The line was so long in from of Red 7 that the SXSW looked at me like I was crazy when I asked if I could pay a cover charge. Then I hiked several blocks uphill (with my soon-to-be-replaced arthritic hip) to the Presbyterian church where Giant Sand was playing. 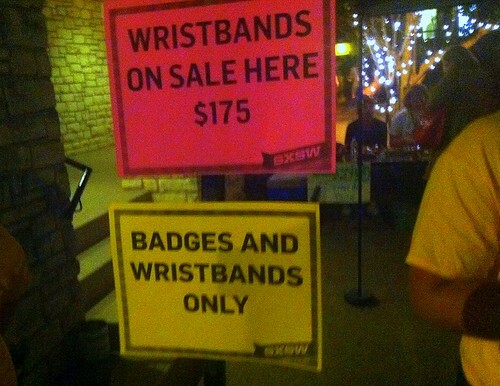 Even though there wasn't a big line, again it was a badge-or-wristband-only show. I even tried to play the crippled old man card. Sorry. Policy is policy. 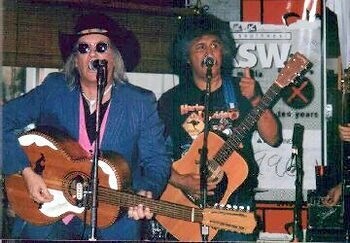 By now it was midnight, so I trudged back to my car, down near I-35 and drove to East Austin where I knew that Ray Wylie Hubbard and Billy Joe Shaver were playing at a bar called The White Horse.. I found a parking spot nearby (free!) and I didn't need a wristband to get in. In fact it was a free show. 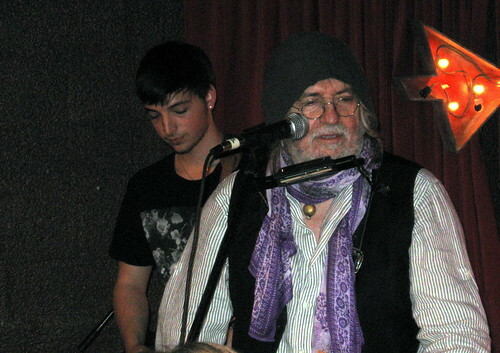 And Ray Wylie Hubbard was onstage with a full band. The funny thing is that I'd started out the day with Ray Wylie Hubbard. 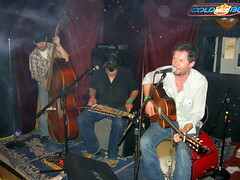 He had done a short solo set around noon at Threadgill's, where I'd just had brunch with family. I didn't mind For one thing, Hubbard sounds best with a band. His songs stand by themselves but they sound best with bass and drums and electric guitar. His son Lucas does that job, both on stage and on the record. And the boy can pick. 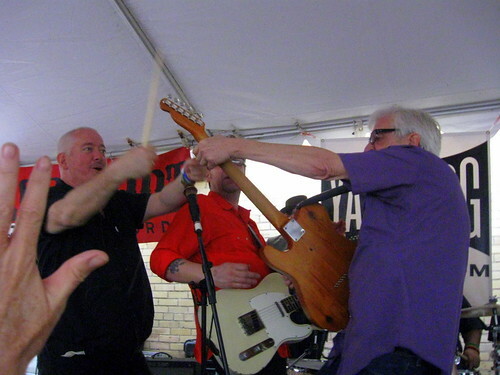 I remember seeing an impromptu set by Hubbard four years ago when I was in Austin during SXSW, Hubbard and son, then about 14, I think, did some blues tunes at Threadgill's. He's learning well. For another thing, his soon-to-be-released album, The Grifter's Hymnal, is the first great album of 2012 as far as I'm concerned. It's got Hubbard's trademark style of snarling, cosmic blues he's perfected during the past few years. Lots of slide and attitude. As I said in reviewing his previous album, " ... unlike his fellow cosmic cowboys of the ’70s, Hubbard stayed cosmic. Since the ’90s ... his best material has been concerned with the wrath of God and the temptations of the devil, of earthly delights and heavenly light. And it’s mostly done with wry humor." Earlier in the day I did catch a pretty cool band over at Waterloo Records. They're called Bass Drum of Death. No, thy aren't some techno band. It's a trio from Mississippi that play a raw blend of blues rock and pop. I couldn't make out any of their lyrics, but they played with spirit. 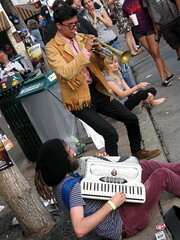 But some of my favorite part of SXSW is hearing music just walking down the street. For instance I came across a fun little jazz band -- trumpet, guitar, snare drum and accordion -- playing "Mack the Knife" and other tunes, on Sixth Street Wednesday afternoon. They sounded a lot better than the one happy guy banging on an acoustic guitar just up the street. And there was a fairly competent metal band called Broken Teeth, playing a free outdoor show on Seventh Street I heard while eating a BBQ chicken Korean taco on my way between being denied entrance to Lee Fields and being denied entrance at Giant Sand. So far today I've been hanging out with my grandson on his first birthday. We'll see what music awaits this evening. UPDATE 3-16-12 : The original version of this post misidentified the venue where I saw Ray Wylie Hubbard do his solo set. I'll Follow Her Blues by The Gibson Bros.